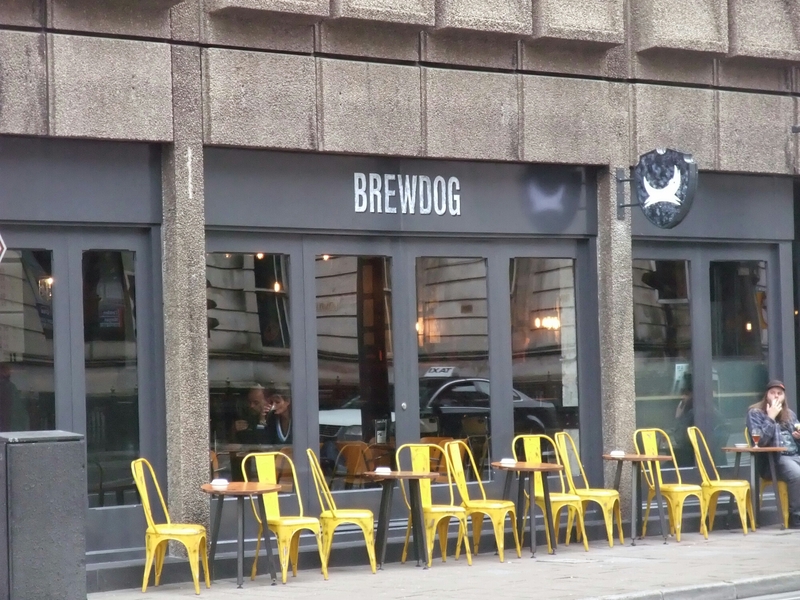 Is it me or does the Brewdog logo look more like a crab than a dog? 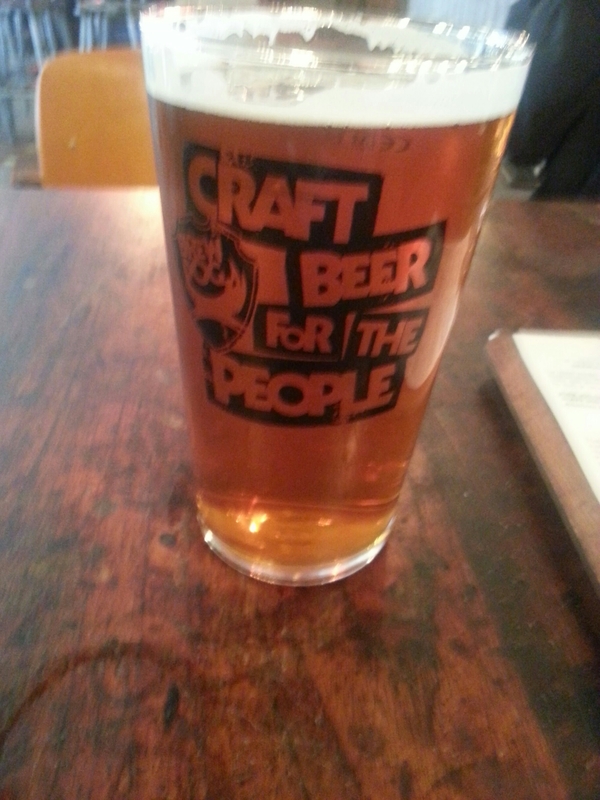 As I get older the more I favour the complex flavours offered by proper craft beers as opposed to the industrial lagers I tended to drink in my youth (in hindsight it was awful slop – what was I thinking drinking it! ). Bog standard lager to me doesn’t have much going for it. It tastes of very little (a boon to many, but pointless if you ask me), is chocablock with chemicals and gives you a banging headache the next day. To be frank it is ghastly stuff. I am too old and weekend down time is too precious to be wasting a day feeling dreadful on the basis of self inflicted pain after a night out. I happily leave that to the youngsters. I also need food if I having a few drinks (the continental way of doing things on this front is so much more sensible), so the positioning of the Urban Tap House and more recently Brewdog within an easy walk from my office is rather pleasing. Both serve proper beer and food to soak it up, making Westgate Street, where they are located, more now in my eyes IPA Avenue or Stout Street (ooh I could go on for ever with this – Boulevard de Bitter anyone). 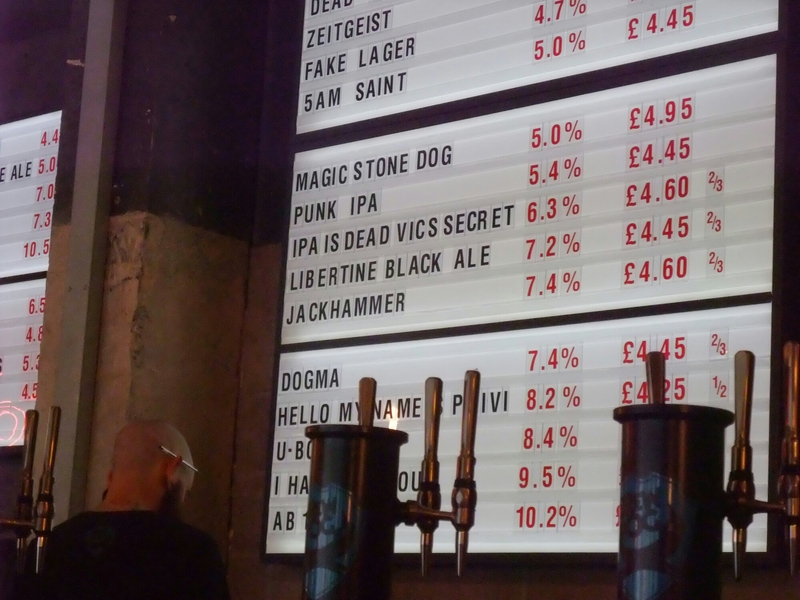 Accompanied by a couple of the chaps who made my recent trip to Rome such a blast, the fairly recently opened Brewdog was our venue of choice for a beer and a bite to eat. 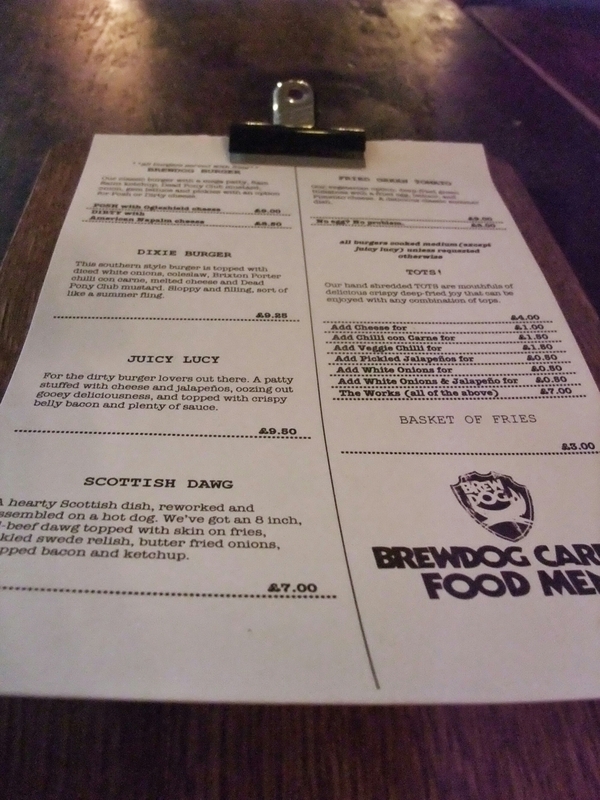 Brewdog in its bars, proudly and somewhat irreverently, champions craft beers (both its own and those of other producers). I loved the fact that they stuck two fingers up at the Portman Group for their serious sense of humour failure over Brewdog’s marketing of their “Dead Pony Club” ale. Good on you guys for that “sorry not sorry apology” – made me chuckle and made a serious point at the same time. The Brewdog Cardiff establishment has a very industrial feel to it, with bare walls, breeze blocks etc. which would not meet with the approval of my friend and work colleague Rachel (I have been told off for referring generically to work colleagues on the blog if that includes her, as after 20 odd years of working together – how she is still sane I don’t know – she thinks she deserves to be referred to specifically apparently. Happy now!?) who thinks every bar should have crystal chandeliers and matching everything. Well Rach, you won’t like the décor here I’m afraid. I, on the other hand, rather liked it and think it is perfect for a bar serving craft beers, burgers and hot dogs. 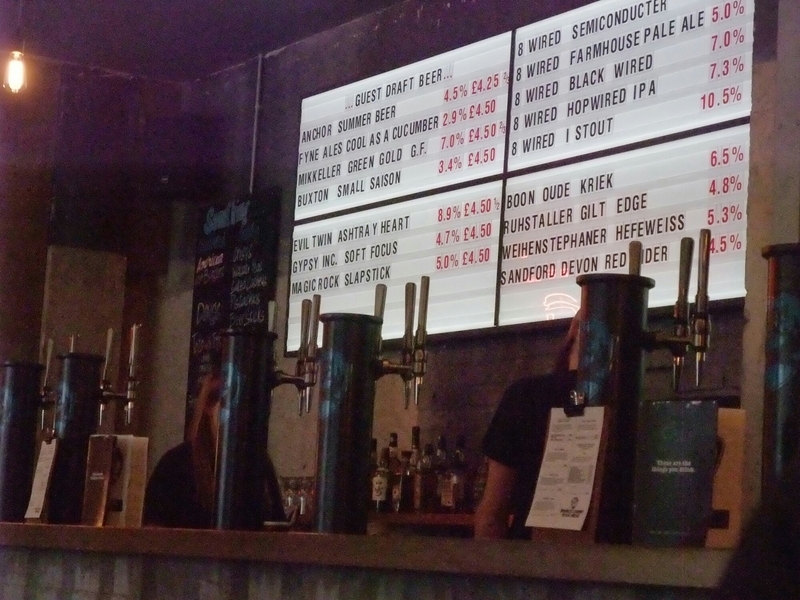 I particularly liked the cinema style display board behind the bar detailing the beers on sale. Some serious heavy hitters (alcohol wise) on that board and it was good to see some beers (rather sensibly so in the case of some of the higher percentage alcohol ones) served other than in just half pint and pint measures (1/3 and 2/3 pint measures being on offer for some beers). The menu is quite small (three burgers, a hot dog, a veggie option, as well as fries and tater tots) reflecting the fact that the food is merely a supporting act for the beer. I went for the Scottish dawg which was described as an 8 inch all beef hot dog with pickled swede relish (the Scottish link I assume), butter fried onions and bacon. It came stuffed with fries (with a load of fries also on the side). The all beef dog was a tasty, meaty whopper of a hot dog and had a good snap to it on biting into it. It also had a really nice smokiness to it. The bun and toppings were nice enough, if fairly regulation, and I couldn’t for the life of me discern the pickled swede (so that Sottish element was somewhat lost on me). With the in bun fries, even with my big mouth, it was tricky to eat hand to mouth as any dog should always be eaten. The skin on fries were nice, crispy and plentiful. They were also properly seasoned. For the £7.00 price tag, this was a substantial and tasty plate (basket) of food. My only complaint was it could have been a bit hotter. Mine was more a warm dog than a hot dog. The fries were also not piping hot. My fellow diners both went for the “juicy lucy” burger (£9.50 including fries). As regular readers will know, I have a particular love of juicy lucy burgers and have a recipe on the blog for them. 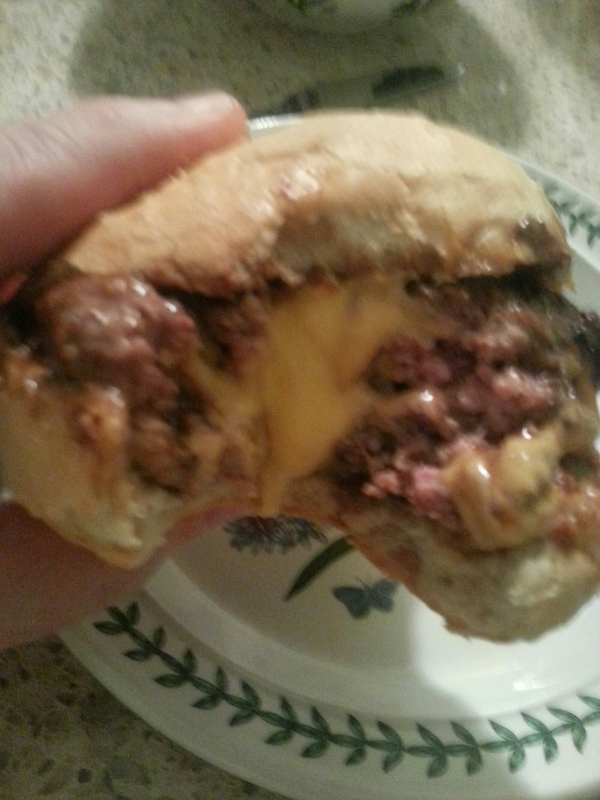 I can attest to the fact that they are tricky to get right as if you don’t cook them for long enough the cheese inside doesn’t melt properly, but if you leave then too long the cheese seems to get absorbed into the burger and you lose the oozing cheese element so integral to a juicy lucy. This is why, I assume, on the menu reference is made to all burgers being cooked to medium unless requested, except the juicy lucy which has to be done so the internal cheese is properly oozey. The juicy lucy burgers here were, I think, a bit overcooked. This had the effect of causing the internally placed cheese to have mostly dissipated. As the USP of a juicy lucy is the gooey melted cheese oozing out of the middle as you bite into it, the limited amount of oozy cheese in the middle of these burgers wasn’t great. Flavour wise the guys said they were tasty and not dryed out, with a good hit of heat from the jalapeños. They were encased in a regular soft white bun rather than the current trend for brioche buns and were none the worse for it. As was the case with my dawg they were not especially hot. 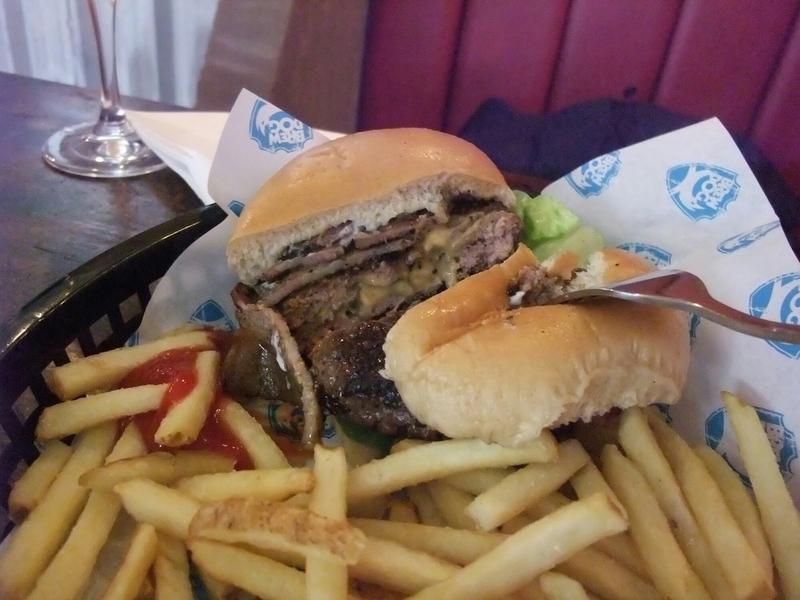 I personally think our food may have sat on the pass for a bit longer than it really should have and this would also not have helped the juicy lucy burgers and retention of the gooey cheese inside. Drinks wise, two of us went for the Dead Pony Club ale, which had a nice light zesty citrus flavour to it (£4.05 a pint). A pleasant beer that was a good match for both the Scottish dawg and the burgers. 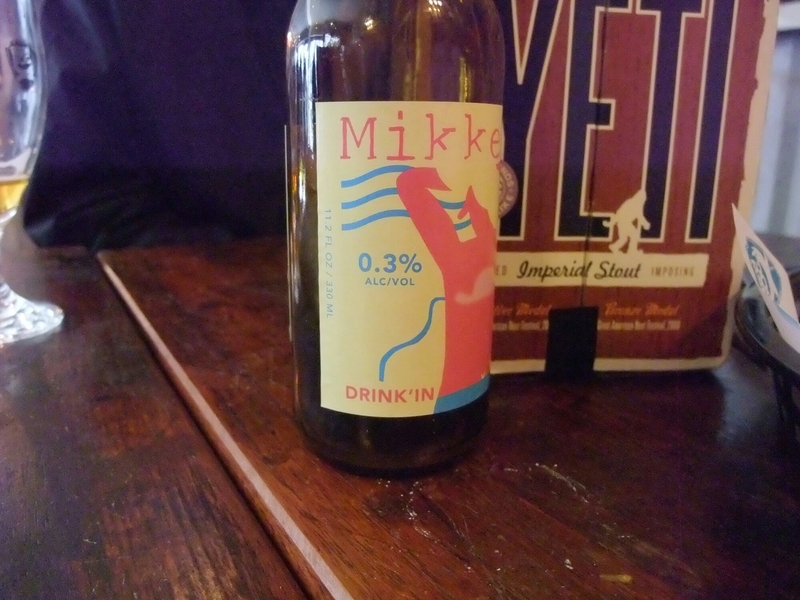 The other drink ordered was a non (well 0.3%) alcohol bottled beer called Drink’ in the Sun 0.3 by Mikkeller (a Danish producer I believe). 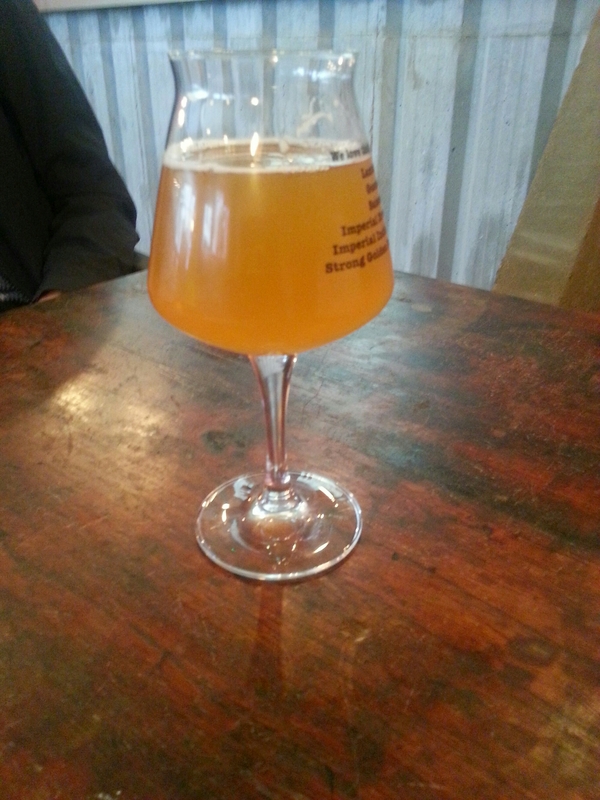 This at first sight seemed to offer promise as a “damn, I’m driving” drink, as it looked the part (the glass that came with it was a bit poncy mind), but (from the albeit small sip I had) it seemed to me somewhat lacking in flavour. Still infinitely better than US Budweiser, but then again what isn’t. Price wise it wasn’t cheap at £4 for a 330ml bottle. Nearly £7.00 for a pint of non alcoholic beer seems an awful lot to me, but I suspect it is very niche and thus not cheap to produce. There were plenty of other interesting non alcoholic options available for non drinkers/drivers, which is good to see. 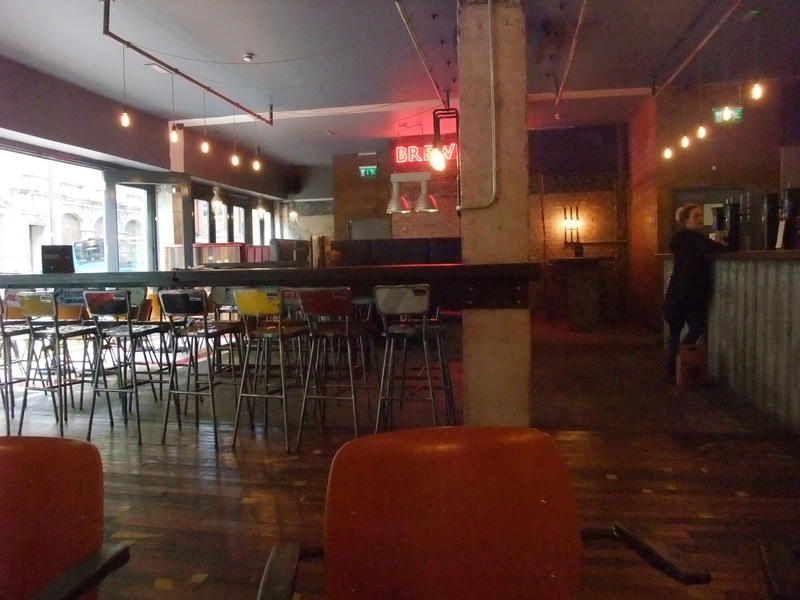 I liked Brewdog and think it is an excellent addition to Cardiff’s craft beer scene. It is exactly my kind of place for a few beers and some grub to soak up those beers. 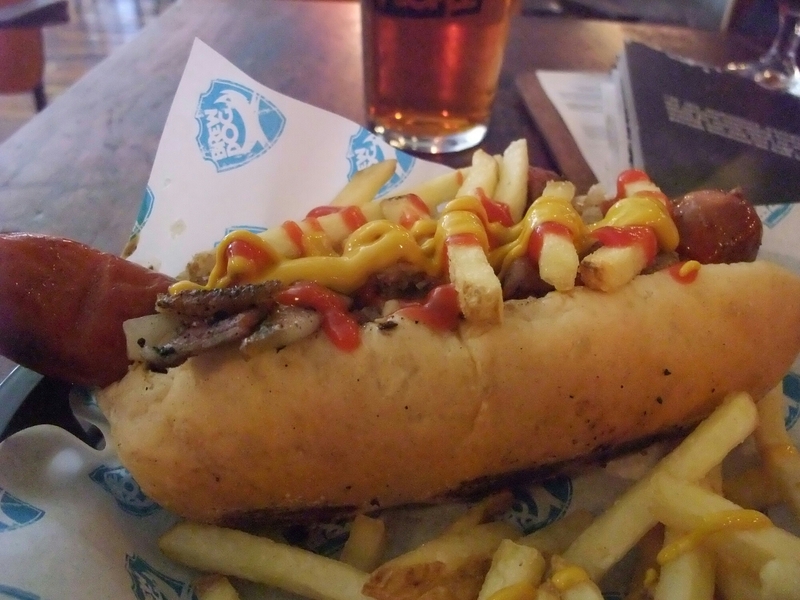 Food wise I enjoyed my Scottish dawg as it had a good smokey flavour to it and was a substantial sized, quality dog. It would, however, have been better if it had been a little bit more of a “hot” dog. Hopefully this slight lack of heat issue was a one off. Would I go back? Definitely – good beer and decent enough beer absorbing food equates to a good combo in my book. Food (not beer) a tad hotter next time please though. 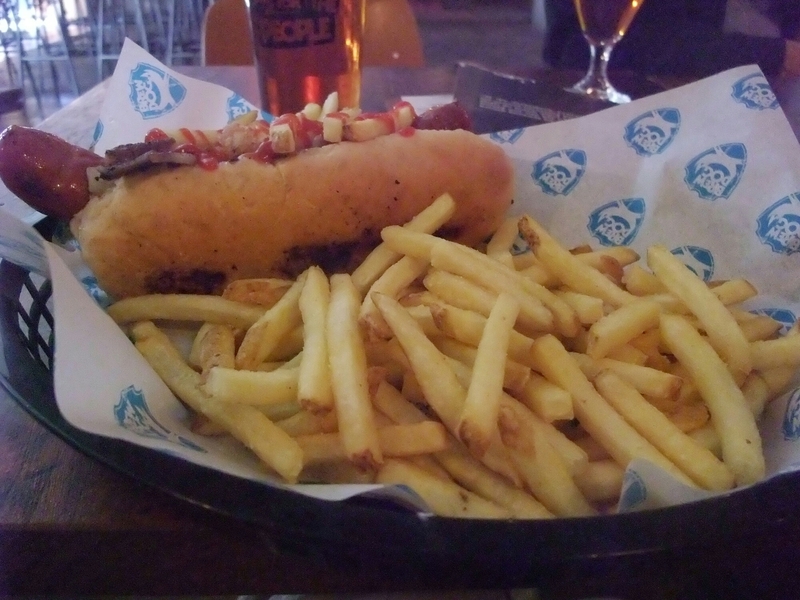 This entry was posted on Aug 31, 2014 by solicitingflavours in Alcoholic drink, Beer, bitter, Burger, Cardiff, dog friendly, Drink, Food, hot dogs, lunch, Non alcoholic drink, Restaurant Review, sausages, Wales.